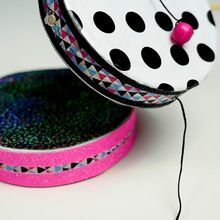 Celebratory sounds are made when you flip the drum back and forth setting your beads in motion. A fun activity for [birthdays], New Years Eve, [Carnival for children] or ringing in the [Chinese New Year]. Kids are sure to have musical fun! This easy craft is fun to make for a children's parade, birthday party or any holiday. The Rattle Drum can be decorated to personalize whatever the celebration or event. 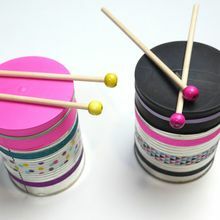 The Rattle drum is a creative activity to do with your school class, family or friends! Get into the groove! Place your container top and trace the shape onto the back sides of 2 pieces of metalic foil paper. Cut the foil paper along the traced lines. Use your glue stick to paste the foil pieces to the flat sides of the 2 container tops. Set aside. Take your string and thread one end through one bead and tie. Repeat this step with the other end of the string securing the second bead. Take one of the container tops and place on a smooth surface flat side down. Place the sting in the center of the container and put the second lid on top. Secure the two lids with the printed craft tape. This creates your drum. Add the small ribbons close to both edges of the drum surface for decorative purposes. Use your scissors to create a hole at the bottom center of the drum where the two lids are connected. Insert your dowel rod to create the drum handle. You are now ready to create a musical beat! Have fun with your fun and entertaining toy rattle drum. 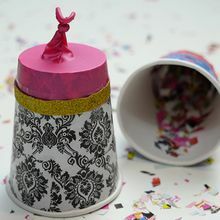 Discover all the interesting kids crafts and activities on Hellokids.com.